issued on March 27, 1900. Back in the mid to late 1800’s there was a quest for scientific information about our earth. Obtaining it from anywhere above the surface meant either using hot air balloons or kites. Airplanes were on the horizon, but hadn’t been made to fly then. This is where William Eddy, a newspaper man, dove in and made history. He saw what was happening in the scientific community and what had to be done, and set about doing it! This is where the kite bearing his name come to be. Now, over a hundred years later, I took what he discovered and brought it up to date. Materials have come a long way from spruce and cotton sail material. Now Epoxy and carbon tubes and ripstop nylon are the norm. The following is how I created a modern version of a classic kite. Depending on the size of your Eddy, the materials will vary. Here are the basic list of parts you will need. plastic or aluminum Tee at the cross points. solid core dacron or a low stretch line for the perimeter lines, bridle and bow line. Eddy had patented his invention in the year 1900. It is that patent that I used for the basis of my modern version. This is the frame, perimeter lines and sail plan for a modern Eddy. Dimension “A” is equal to dimension “B”. The point where the spine crosses the spreader is 19 percent of “B”. A plastic or aluminum Tee is used at the frame crossing point. This tee is similar to ones used on sport kites. The spine is on the sail side while the spreader is above. This allows for a “keel” effect along the spine by the sail. I also make the spine and spreader stop at the tee so they don’t shift up or down or left or right. The holes in the tee are big enough to allow an interior connector or ferrule to pass through while the spar stops against the tee. Arrow nocks are added to the ends of the frame. Aluminum rings are attached to the arrow nocks with a very short loop of heavy line larksheaded to the ring, and a knot in the heavy line used to jam on the far side of the nock. This allows for easy assembly. One last thing on the perimeter lines… I make the top (red) line a bit tighter than the bottom (green) line. This makes the wingtips sweep forward just a bit so when the bow line is tight, the line crosses the spine about an inch above the Tee. This is also from the patent description. The finished size of the sail can only be determined after the frame and perimeter lines are complete. The height is equal to dimension “D”. This is the distance between the points where the perimeter lines are attached to the rings. the finished width is 7% more than dimension “C”. This will allow for the “loose fit” that Eddy himself describes in his patent. Either a seam allowance big enough to allow the perimeter strings to pass through or a leading edge material can be applied along the leading and trailing edges. I have used both successfully. I always add 4 oz. 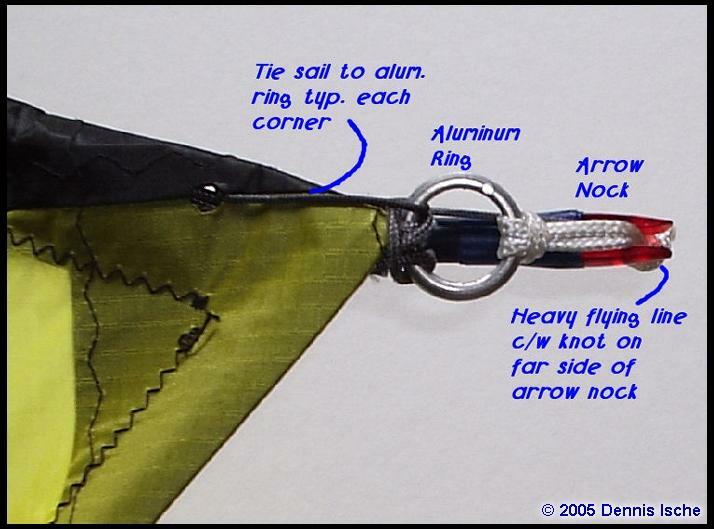 dacron reinforcing at the wingtips and nose and tail to take the rubbing of the perimeter lines on the sail. One last note on the sail. I tied the nose/tail/wingtips to the aluminum rings to keep them in place. The tail especially will “ride up” the perimeter lines as they move inwards. A hole or two melted through the reinforcing and a line passed through and tied through the ring does the trick. There were a few things along the way that made building these kites easier. 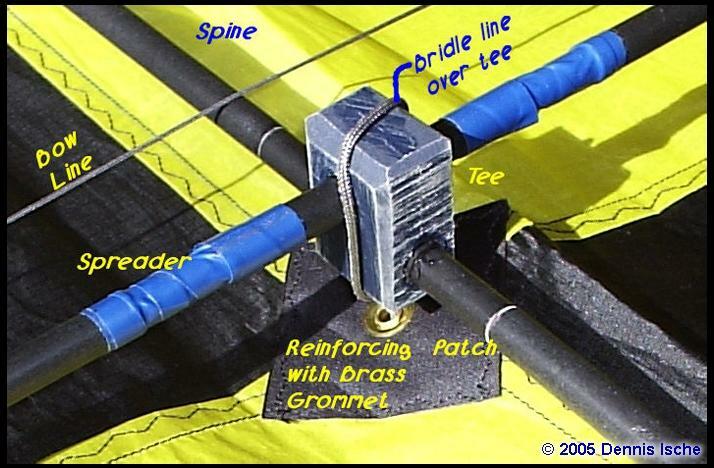 I always put a piece of dacron reinforcing at the cross point on the sail and a brass grommet at the same point to allow the front bridle point to be tied to the Tee. Speaking of the bridle… the front point is at the Tee or cross points of the spine and spreader. The rear point is at the tail arrow nock. I usually larkshead the bridle to the arrow nock/frame. Then pass the heavy line of the aluminum ring through the bridle loop and over the arrow nock. The bridle point stays “put” that way. The length of the bridle is one of constant debate. Taking the initiative, I did my own thing. I took notes from my fighter kites and when the bridle is pulled tight it is approx 1 to 2 inches in from the wingtip. That way it won’t get caught up over the wingtip in flight. Man, that can ruin your day. I larkshead another aluminum ring with a tow loop on the bridle to allow for easy adjustment. Works great. You will find the typical tow point is just ahead of the leading edge when the bridle is pulled tight and laid down on the sail. The bow lines are made from the same line as the bridle/perimeter lines. I make a loop in one end and hook it to a wingtip nock. Then run back around the other wingtip nock and then a slip knot is tied that allows for the bow adjustment. (see below). Saves buying more material and works very well. Well that should get you one cool modern Eddy Kite in the air. 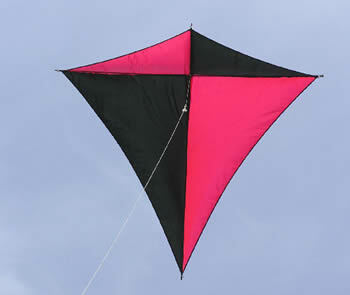 When flying your new kite you can adjust the tow point till the kite is pretty much “glued” in the sky. If it has a tendency to tilt over you have the tow point too far back towards the tail… move it up in small steps. If your kite dances around you probably have the tow point too far forward. Move it back. The larger kites really pull hard so be sure to use appropriate flying line. In strong wind I use 500 lb. braided dacron on the 9 footer. Just to give you an idea. Enjoy yourself…. Fly safely… know that you are flying a “Classic” design that you can be assured nobody else has! This entry was posted in 2005, General Topics, Issue 45 (Nov/Dec), Kite Making, KL Archive and tagged eddy, kite making, kite plan.